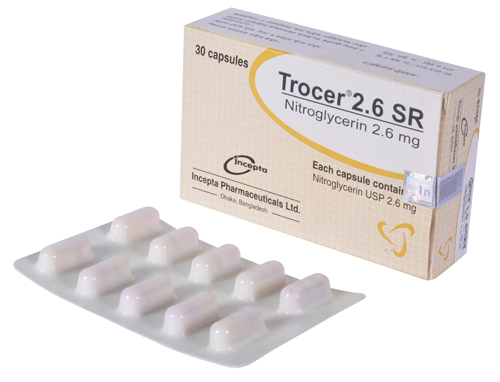 Trocer® 2.6 SR Capsule: Each capsule contains Nitroglycerin sustained release pellets equivalent to Nitroglycerin USP 2.6 mg.
Trocer® 2.6 SR Tablet: Each sustained release tablet contains Nitroglycerin BP 2.6 mg.
Nitroglycerin SR is a potent coronary vasodilator. It also reduces venous return, lowers end-diastolic pressure in the right and left ventricles and improves myocardial function. 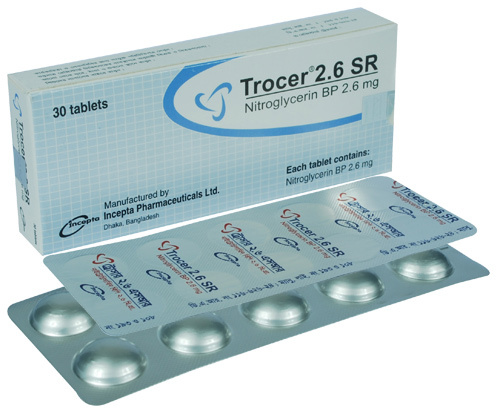 Nitroglycerin SR possesses sustained effect because its absorption from the gastrointestinal tract is long lasting and continuous, due to the sustained release of active substance from the capsule. The duration of its effect, which lasts 6 to 8 hours makes it particularly suitable for the prevention as well as for reducing the severity of anginal attacks when given in long-term treatment. Nitroglycerin SR increases the tolerance of anginal patients to exercise and decreases the sublingual Nitroglycerin demand. Acute symptomatic relief of angina pectoris; prophylactic management in situations likely to provoke angina attacks; long-term prophylactic management of angina pectoris due to coronary artery disease. 1 capsule/tablet 2 times a day before meal (e.g. at 8 AM & 2 PM, with a daily nitrate-free interval of 10-12 hours). If necessary the dosage may be raised gradually to 2 or 3 capsules/tablets 2 times daily. But dosage should be individualized depending on the Nitroglycerin sensitivity of the patient, the severity of illness and the occurrence of side-effects. Use in Children: Not recommended for children. Headache, dizziness, weakness, mild gastrointestinal symptoms may occur. They disappear on dosage reduction and usually do not necessitate the discontinuation of the treatment. Regular use of Nitroglycerin SR (three times daily) should be avoided because of the developing of tolerance. Two times daily administration and withdrawal for a short period may re-establish the original sensitivity. There is no evidence relating to the safety of nitrates in pregnancy and lactation. Therefore, Nitroglycerin SR may be used in pregnancy and lactation only when considered essential by the physician.